J. D. Salinger invented the central character of The Catcher in the Rye 10 years before the publication of that novel. The sixteen-year-old Holden Caulfield first appears in the story “Slight Rebellion Off Madison” which Salinger sold to New Yorker magazine in 1941 and which he later transformed into Chapter 17 of The Catcher in the Rye. “Slight Rebellion” is the story of Holden’s relationship with his girl friend Sally Hayes. Holden eventually alienates Sally by calling her “a royal pain” because she doesn’t want to run away to the woods of Massachusetts or Vermont with him. The New Yorker shelved the story in 1941 but finally published it in 1946. … Salinger’s choice of the first person point of view not only gives the novel its special flavor of authenticity, it also allows Holden to express thoughts and feelings that we would not be aware of if the novel were told by from an objective third person point of view. The choice of the first person point of view strengthens the reader’s identification with the narrator-protagonist and ultimately makes the reader care more about the Holden’s personality than the events of the plot. “Maybe I don’t. Maybe you don’t either,” Sally, said. Holden, stood up with his skates slung over one shoulder. “You give me a royal pain,” he announced quite dispassionately. “Maybe I don’t. Maybe you don’t either,” old Sally said. We both hated each other’s guts by that time. You could see there wasn’t any sense in trying to have an intelligent conversation. I was sorry as hell I’d started it. The major difference between the scene in the story and the novel is that we learn much more about Holden’s thoughts and feelings in the novel than we do in the story, and we can therefore identify more with him. Only a year after Salinger’s professional debut in Story, he achieved an accolade few apprentice writers could anticipate, when a story about Holden Caulfield was accepted by The New Yorker; but alas, the attack on Pearl Harbor followed too close on this acceptance, and the story was shelved for the duration. An updated version, “Slight Rebellion Off Madison” appeared in postwar Christmas issue (21 December 1946)…. Sarah Graham and Jack Salzman say little more than the fact that the story was written in 1941 and published in The New Yorker in December of 1946. Dominic Smith mentions that the story was published, but it was not collected in Nine Stories. Finally, DeadCaulfields.com points out that the story was republished fairly recently in David Remmick’s Wonderful Town: New York Stories from The New Yorker (2000). Why is Holden’s only a “slight rebellion?” What does this say about his character? Does this version of his character live up to the Holden Caulfield reputation? Eberhard Alsen and Warren French comment on Salinger’s use of the objective third person in “Slight Rebellion Off Madison.” They criticize the story by comparing its voice with the later first person from The Catcher in the Rye. While we do get a different image of Holden Caulfield, is it fair to deem this story a weak one? Does the long gap between composition and publication, with WWII in between, affect our reading of the story at all? How do the ads in the original publication contribute to the narrative? Notice all of the bars advertised are within short walking distance of the story’s setting. The far off vacation spots are places Holden and Sally could vacation without having to resort to staying in a cabin in the woods. Then, there are all of the ads for clothes and liquor, and – other things that Holden hates about school. Is this intentional, or coincidence? French, Warren. Twayne’s United States Authors Series: J.D. Salinger, Revisited. New York: Twayne, 1988. Print. Graham, Sarah. Routledge Guide to Literature: J.D. Salinger’s The Catcher in the Rye. New York: Routledge, 2007. Print. Greiner, Donald J. “Updike and Salinger: A Literary Incident.” Critique 47.2 (2006): 415-30. Literature Online. Web. 17 October 2009. Salzman, Jack. New essays on The Catcher in the Rye. New York: Cambridge UP, 1993. Print. Smith, Dominic. 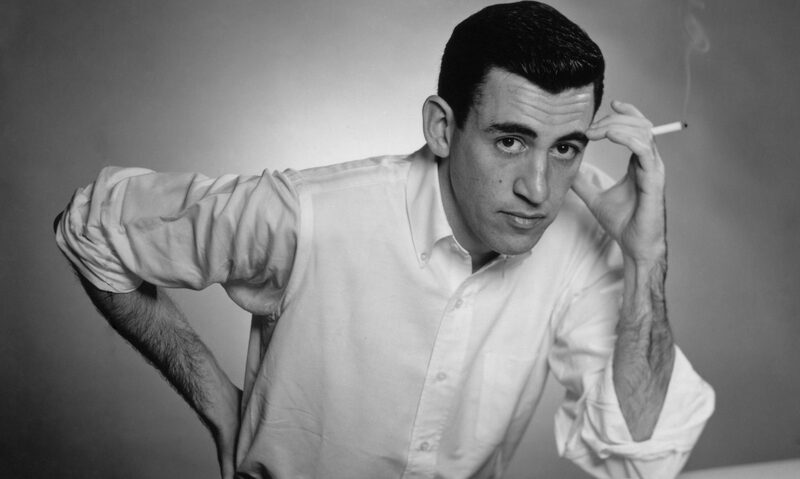 “Salinger’s Nine Stories: Fifty Years Later.” Antioch Review 61:4 (2003): 639-49. Literature Online. Web. 17 October 2009. “Uncollected Stories of J.D. Salinger.” DeadCaulfields.com. 14 August 2009. Web. 1 November 2009.